"Watch Crazy Heart," wrote Graham. "That's all I'm going to say." He sent that a few days ago, the first suggested must-see from a good friend. It stuck with me. So, last night, going to Shaw On Demand, the first movie that jumped out at me under New Releases was Crazy Heart. 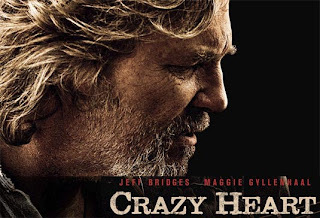 The soft and subtle story of an aging country music performer named Bad Blake, Crazy Heart is really about coming face-to-face with your demons, real and imagined. Sentenced to musical purgatory, playing bowling alleys and backwater bars, Blake chain smokes and is soused almost 100 percent of the time. He drives and drinks, not even bothering to pull over when nature calls, rather, just doing his business on the fly and into a plastic bottle. He is a shadow, a whisper, a murky fragment of friends and acquaintances from my past who have battled the bottle and nasty demons. Portrayed by Jeff Bridges, Bad Blake is reminiscent of a latter-stage Waylon Jennings, or Willie Nelson of 20 years ago. His young love interest playing by Maggie Gyllanhaal is a mystery that never does get sorted out. She is young and beautiful, the mother of a four year old boy. Why she ends up taking up with this old, rundown, sweaty, smelly, travelling troubadour, is never really addressed. But she becomes his muse and his inspiration for living. In some ways, I wonder why that role couldn't have been played by the gussied up bar hag who he took up with in scene one? Now, that would have been interesting, and probably closer to realty. All things aside, the film is good, Bridges' performance is believable and compelling. And his singing was pretty good, too. It earned him the Academy Award for Best Actor, his first.